What’s that got to do with the price of kittens? How much does a kitten cost is something that you may wonder when buying a kitten. So when considering purchasing a pedigree kitten and you are scrolling through the adverts on various websites, you may also notice the wild price differences. For example, I just looked at a well-known pet advertising website to check the variations. 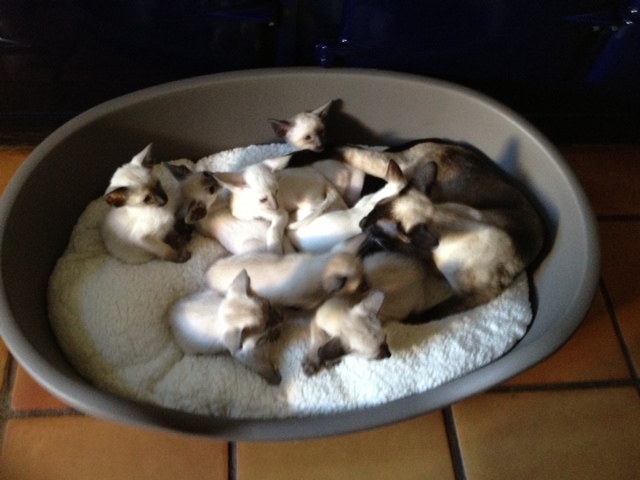 The lowest priced Siamese kitten available was £100 the most expensive £500. What’s that all about? A Siamese is a Siamese right? How come some are cheaper than others? Like everything in this world you get what you pay for and if you don’t pay much then it is not surprising when you don’t get much in return, it really is that simple! Let me give you an idea of the costs involved that any legitimate breeder needs to cover when raising a litter of kittens. It will give you some understanding of exactly what you’re paying for when you buy a registered pedigree kitten. Please remember that no two litters are the same so costs will vary but nevertheless this should give you an idea. To breed a litter of kittens then firstly the breeder will need a female cat (breeding queen) that is old enough to be mated. The price of a breeding cat can vary but for the sake of this article let’s use a Siamese cat, she cost £450. She also needs to mature to approximately twelve months old which is the average age for a Siamese to be ready to have her first litter of kittens. In between being a kitten and reaching maturity she will of course need to be fed and will also need to use the litter tray and could well have even needed to see the vet. Costs involved – how long is a piece of string! The breeder then needs to find a stud boy to take their queen too. Hours of research goes into finding the right boy for your queen. You have the breeding girl; you have also found the perfect stud cat. Breeding starts with a trip to the vets and a blood test to ensure your queen is free from Feline Aids and Leukaemia (FIV and FELV). Both FIV and FeLV are fatal and are also contagious. The cost of this test is anything between £35 and £60 depending on the vet. All reputable stud owners will insist on this test before accepting a queen into stud. Now you have shelled out at least £35 for the test, you have twenty-four hours to get your queen to her mate. I have travelled hundreds of miles in the past to take a girl to the right boy, this is not unusual. Of course this costs money for petrol as well as time. The queen has her honeymoon and stays a few days, after which you drive all the way back to collect her and of course this adds further fuel costs to the ever rising costs, for arguments sake let’s call it £80 for fuel. When you collect your girl the stud fee is payable, presuming of course the cats have actually mated, if not all costs to date are lost and will be repeated if you decide to try again. Stud fees on average cost half the price of a kitten and in Siamese the stud fee is usually £200. A pregnant cat requires different nutrition and higher quality food than normal to aid her growing kittens. Most breeders will start their pregnant queen on a high quality kitten food which costs more. A pregnant cat will also be eating for possibly five so the quantity of food eaten increases too. More food eaten means more waste in the litter tray so more cat litter will also needed. The costs here are difficult to determine so again for arguments sake let’s just call it an extra £60 over the nine weeks a cat is pregnant. Birth can be a costly business. Many people don’t realise the risks involved for cats giving birth, the complications can be expensive as well as heart breaking. Thankfully 90% of the time things go well but when disaster strikes you have to be prepared to do whatever you need for your queen and her kittens. Unfortunately I have had first-hand experience of an out of hour’s emergency caesarean section which cost me over £500, a ton of heartache and two dead kittens. I know other breeders whose journey has ended far worse with the loss of their queen and all the kittens. Please remember £500 was the fee I was charged but due to wildly varying costs you could be looking at anything between £500 and £1200 depending on the vets. The kittens have arrived; so far the cost of the litter is a minimum of £365. This of course is with everything going to plan with no repeat blood test, no repeat fuel cost for a repeat mating, no trips to the vets during pregnancy and also a natural birth. When the kitten stork arrives you never know how many she will bring. An average sized litter is four or five kittens. For the first three weeks all is well and you continue the same diet as in pregnancy for your queen. However if you have kittens that are not feeding well from mum then you will need to supplement them with kitten milk and will also need hand feeding equipment which will both cost money. Week three arrives and you need to wean the kittens; for arguments sake you have five mouths to feed four times per day. You queen will continue eating the same increased amounts of food because now she is trying to get herself back in condition. Also your kittens are now far more mobile, they will need litter trays everywhere which also adds to the cost of raising a litter. Your kittens are nine weeks old; they are doing really well with not a single visit to the vets! (in your dreams!) Now it’s time to get them vaccinated and register them. The current price for registering a litter of five kittens with the GCCF is either £50 or £95 depending on whether you have a GCCF prefix or not. Vaccinations should be provided for every pedigree kitten sold, there are two essential vaccinations, flu and enteritis but you can also have FeLV vaccine too. Each kitten costs approximately £45 to £70 each to vaccinate, again depending on how much the vet charges. Then there are the essential worming and flea prevention treatments and these cost roughly £6 to £8 per kitten. Don’t forget the cost of advertising and finding homes for kittens, there are a few websites out there where it is free to advertise kittens but your litter is usually one of many on the site. Most serious breeders have their own cat breeders websites which really is a must these days. Cat breeders websites usually cost an annual fee of between £200 to £300 though this could easily be as much as £500. Having extra cats in the house will mean an increase in cleaning cost, having a litter of hooligan’s kittens in the house is a whole different ball game. Think about cleaning materials, bin bags, washing powder and electricity costs for the washer and dryer and the potential damage to your furniture over a thirteen week period. Well this section of my article is easy as I know of not a single reputable breeder who earns any wages whatsoever. The time involved in researching pedigrees, cleaning litter trays and cat sick, taking time off work to go to stud or to be at home when kittens are born, hand feeding kittens are just a few of the things breeders do that eat up their time. They do this though because they love their cats and chosen breed, they don’t expect wages or profit (just as well really). Don’t forget breeders also have to factor in the costs of smaller litters, fatalities, ill or deformed kittens that end up staying with the breeder permanently and also the costs involved in keeping kittens that don’t find homes by thirteen weeks old and need to stay at home a little while longer. So How Much Does a Kitten Cost Then? So this is the point where I get the calculator out and show you just how much a kitten costs to rear. Well guess what I have chickened out because if I add it all up and my husband reads this article I will be in BIG trouble! What I am trying to get across is that breeders don’t make money. After reading this if you still want to purchase a low cost kitten that’s up to you but I personally would opt for a healthy well-bred one which you certainly won’t find for under £350 in the case of a Siamese. Next time you are looking for a kitten and the first question you ask is the price, immediately followed by asking for a discount or complaining that you have seen other kittens on the net for £100 don’t be surprised if the breeder is not amused and declines your offer. Kate! This is a most excellent article and you have captured the very essence of what we do… Of course add on to the bill the show fees and expenses we pay out to get our fabby furry lived ones made up to champion etc… But I reckon that could be a whole new article!! 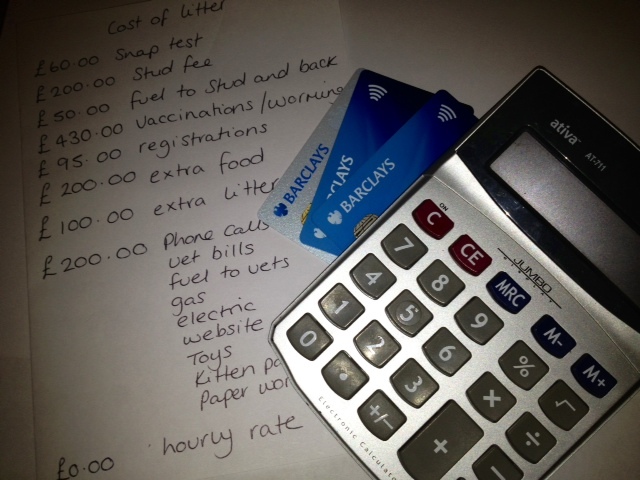 How true Pina, I have stopped adding up what I spend on fuel and show entries…. scary!! Brilliant article and so very true. Thanks Kate, great article! Our vet practice charges £85 for a SNAP test and the same for vaccinations! And the cost of an out-of-hours caesar is eye-watering! It has been a little while since this article was posted, I just wondered if anyone had any further thoughts on this article? 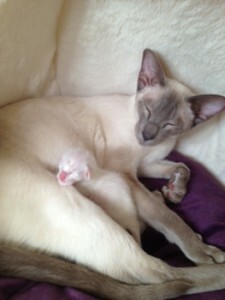 I’ve been enslaved by three Siamese kittens from Celia Simpson (Shermese). They are worth every penny. A reputable breeder will put a lot of effort into raising nice well adjusted cats, so why shouldn’t they at least get back some of the costs involved. Excellent article but with the insurance from Agria through GCCF we can now cut our costs by insuring our cats, they cover infertility, breeding, sections and kittens to the point if one is ill its existing condition is put on its insurance policy in new home. Have insured my girls and boys and feel more secure knowing I have a backup plan . True Carol, this is one small way that we as breeders are able to try and limit our losses with insurance. Of course we would have to pay the insurance premiums but it would be worth it for those of us that needed to claim.